Link Bubble Released yesterday by the Australian developer who’s also behind some great applications like Tweetlanes and Action Launcher, today unveiled his latest creation – Link Bubble. Link Bubble is an all-new browser designed and crafted solely with mobile devices in mind. 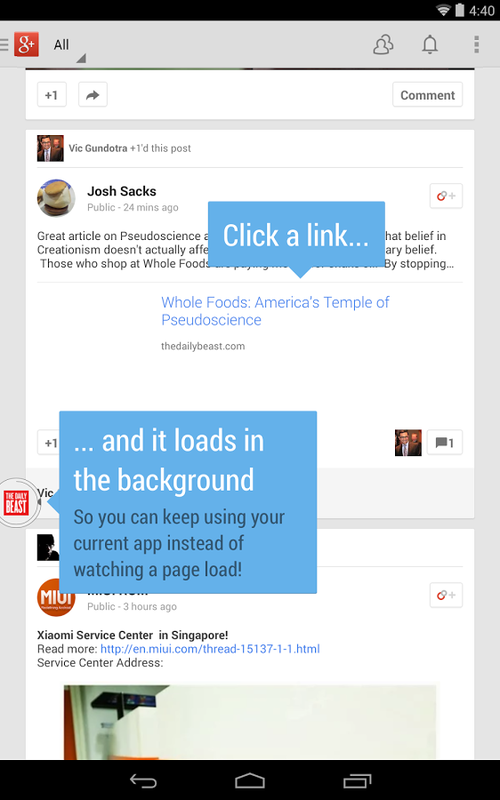 Link Bubble is free, but it’s limited to opening links from just one Application. But, there’s an option to purchase a pro version which unlocks the multi-tabs which will all load in the background while you continue surfing the web, Twitter, Google+ or whatever application you want. It’s $4.99 to upgrade to the Pro Version. There’s also another neat feature that Link Bubble brings to the party, it detects YouTube video embeded in webpages and gives you an option to load them up in the YouTube App. You can get the free version from Google Play, here. Or the Pro version is available on Google Play, here.